Power for passes protrudes as the main reason to purchase the Kookaburra Team Ignite hockey stick and while we review this hockeystick you can get an amazing bargain on one of Kookaburra’s top of the range stick. What level of player is the Kookaburra Team Ignite for? From the Kookaburra hockey stick range the Team sticks are the top of the pile. The Team Ignite hockey stick would suit players of a really good standard and if you buy smart with this 2014 model the stick makes a fantastic option for an improving player looking for more power. How come there’s all this talk about power? From many of the best hockey sticks we review the Kookaburra Team Ignite packs more punch to the pound than many. A combination of build features is designed to hit the ball hard. High carbon content is the first thing to review. 95% carbon makes the Team Ignite hockey stick stiff and the way Kookaburra set up this hockey stick material choice is impressive. 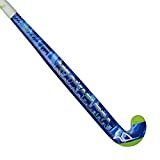 All the latest manufacturing processes are use, fabricated carbon construction, nano technology, triple core of internal chambers and KVR are all elements of manufacturing used in the Kookaburra Team Ingnite that prove the power of this hockey stick review. Can I improve my reverse side hits with the Kookaburra Team Ignite? When I started to review the Kookaburra Team Ignite one of the standout things about the stick is how well it strikes the ball, particularly on the reverse edge. With a low sweeping hit the ball just pings off the inside edge of the hockey stick. If you are reading hockey stick reviews with a view to find a stick to improve your reverse side hits this could be the stick for you. But what’s the Kookaburra iBow shaft like to play with? Personally I like the Kookaburra iBow and am over the moon the hockey stick brand has introduced a top end stick with this shape. It is subtle though, with the Team Ignite review the curve of 24.75mm reaches its maximum bend at 275mm up from the ground. Because the hockey stick is curved all the way from handle to heel it actually feels very smooth. The curve and it’s position make the Team Ignite iBow great for slaps, hits and pushes but you probably won’t pull off monster drag flicks with it. Can I run with the ball using the Kookaburra Team Ignite hockey stick? You sure can, the shaft shape is really great for dribbling with and the Kookaburra heads are coated with KCF which is basically an abrasive area that is designed to grip the ball nicely. One of the coolest features to review about the Kookaburra Team Ignite is the Euro Maxi head. It’s called Euro because the Australians often prefer a hook head however the Euro Maxi on the Kookaburra is great, particularly for dribbling. Kookaburra Team Ignite’s maxi head has a great gap between the shaft and toe of the head in which you can control the ball nicely for those quick spin turns to fool defenders. Should you buy the Kookaburra Team Ignite 2014 model hockey stick? This Kookaburra Team Ignite review has focused on the features of this great stick, the missing aspect is the price. The 2014 model has rocketed down in price across the world since the release of the 2015 model. And there isn’t much difference between the two models. At a price anywhere around 100 you will be getting a great hockey stick for an amazing price. If you want to maintain or increase power in your hits then the Kookaburra Team Ignite is an awesome stick for you. You can also check the whole Kookaburra hockey stick range review for the complete 2015 range.